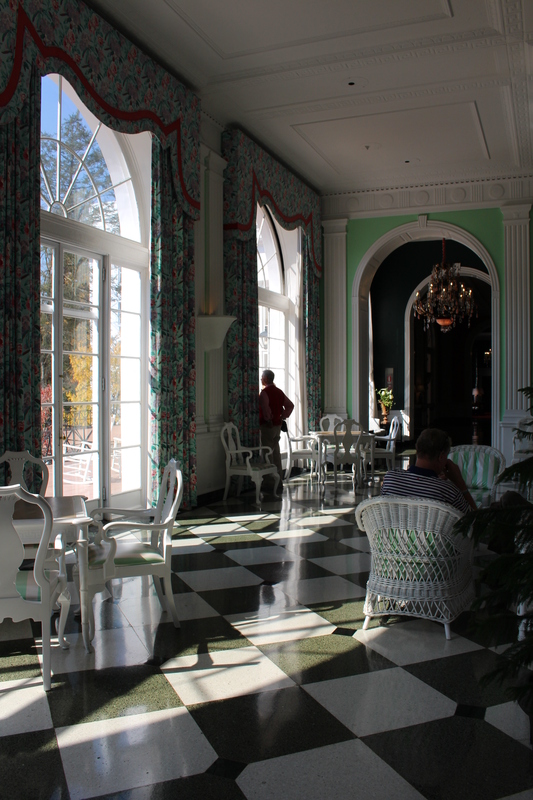 Fall color inside and out: Tamarack and The Greenbrier | Oh, the Places We See . . . The stately entrance to The Greenbrier in White Sulphur Springs, West Virginia. Any fall trip through West Virginia, Virginia, North Carolina, and Tennessee can be considered spectacular if you hit the color change just right. 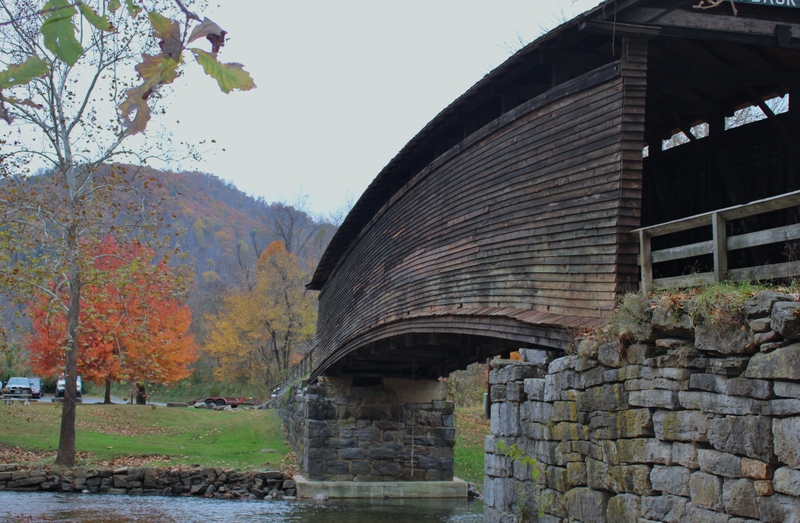 And catch the color we did during our Fall 2015 Leaf Peeper Tour. Beginning with natural beauty at Pipestem State Park in West Virginia and continuing to Humpback Covered Bridge in Covington, Virginia, we saw nature at its golden best. But sometimes color bursts forth indoors, too. 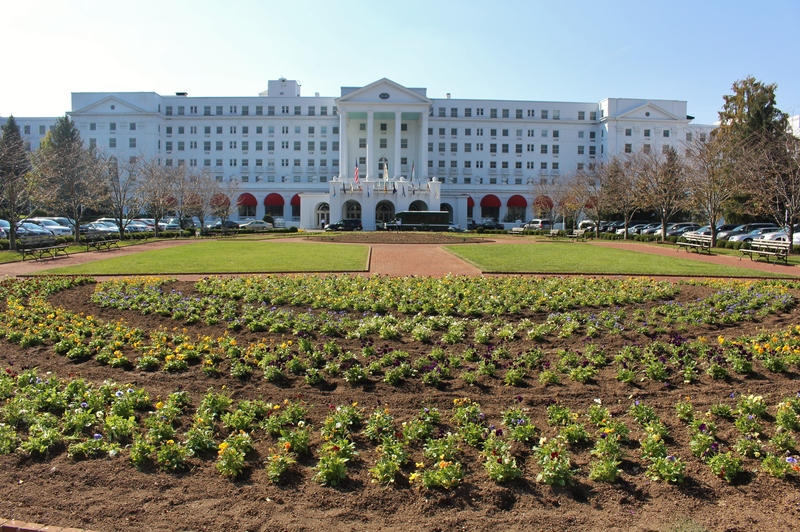 Like it did in two of West Virginia’s attractions: Tamarack in Beckley and The Greenbrier in White Sulfur Springs. From Pipestem in the south of West Virginia, we followed I-77 north to Exit 45 where the iconic red peaked roofline greeted us to one of the finest collections of arts and crafts known as Tamarack: The Best of West Virginia. 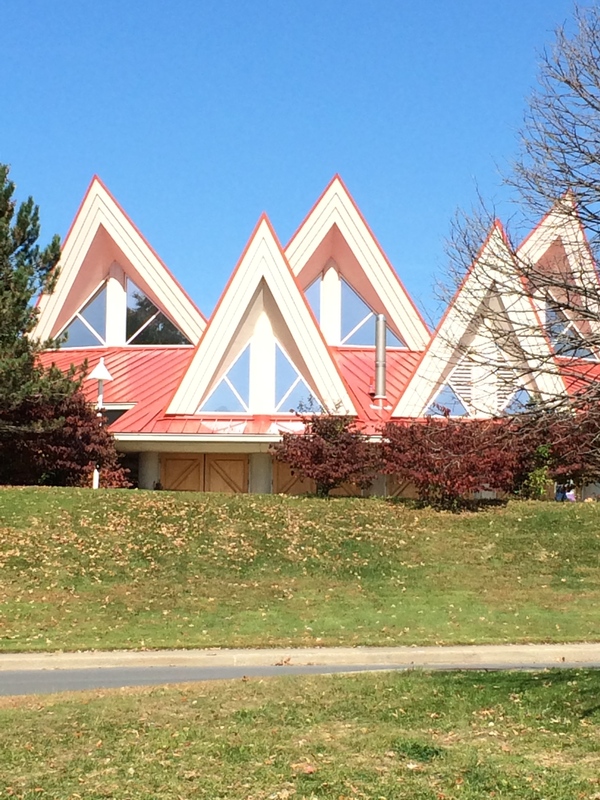 Peaked roofline of Tamarack greets you as you take exit 45 off I-77 at Beckley. And best it is. 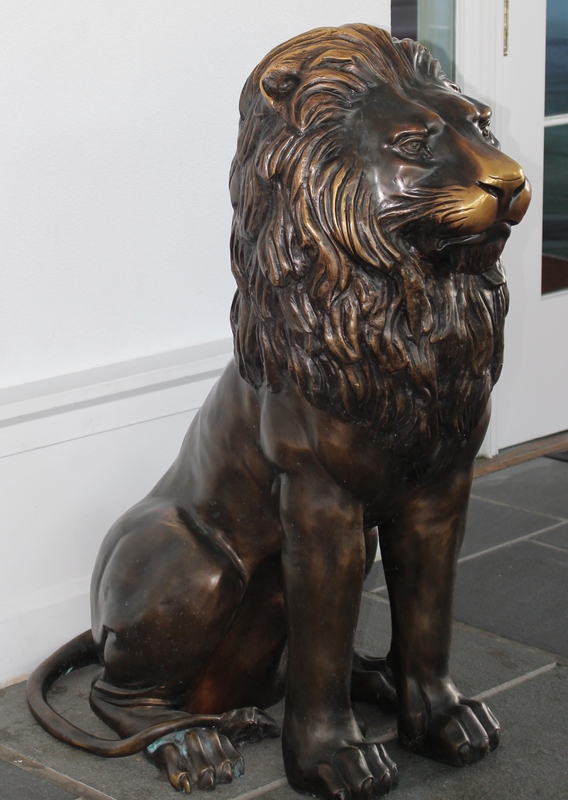 With juried artisans from all 55 counties in the state contributing fine crafts, photography, glass, and foods, Tamarack is known globally for regional art and local cuisine. 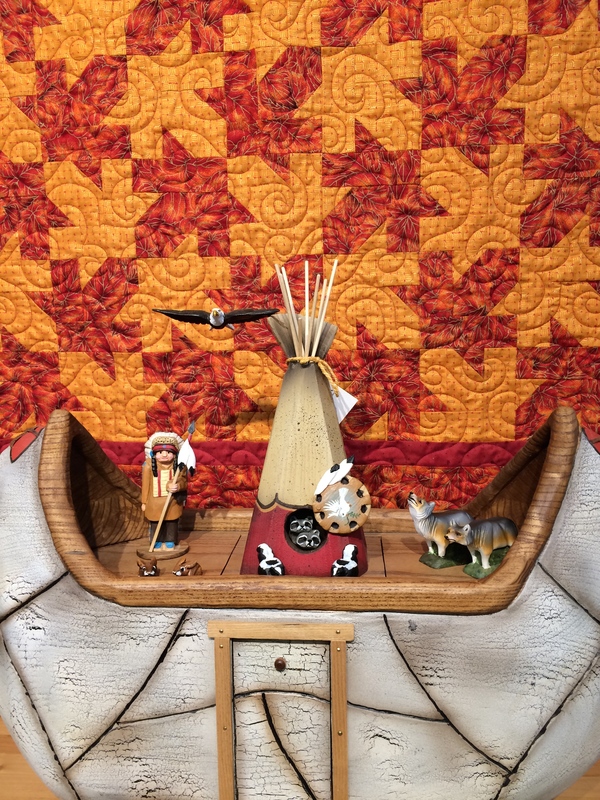 A colorful quilt forms the backdrop for a folk art boat at Tamarack. The circular building guides you through areas of similar crafts — textiles, treenware, glass, furniture, apparel, jewelry, etc. All colorful. All quality. All handmade. 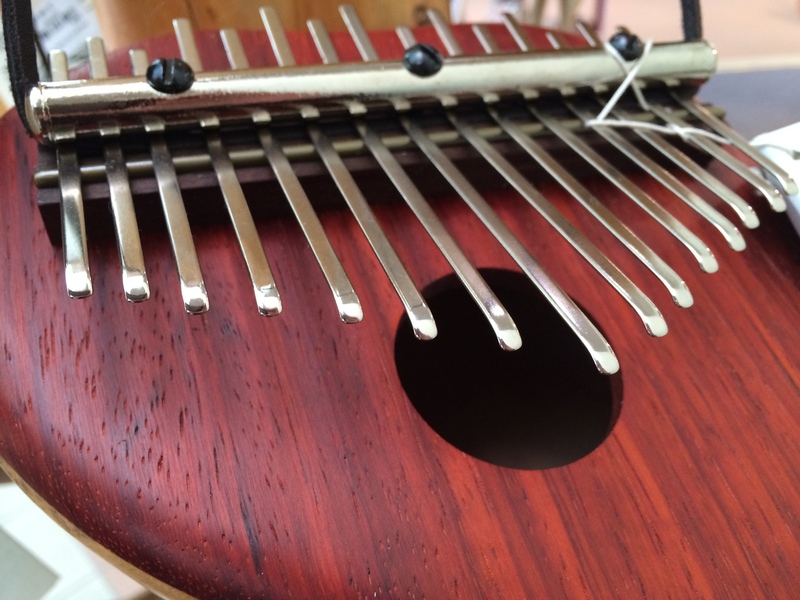 This tiny, handmade finger piano comes with instructions on how to play. 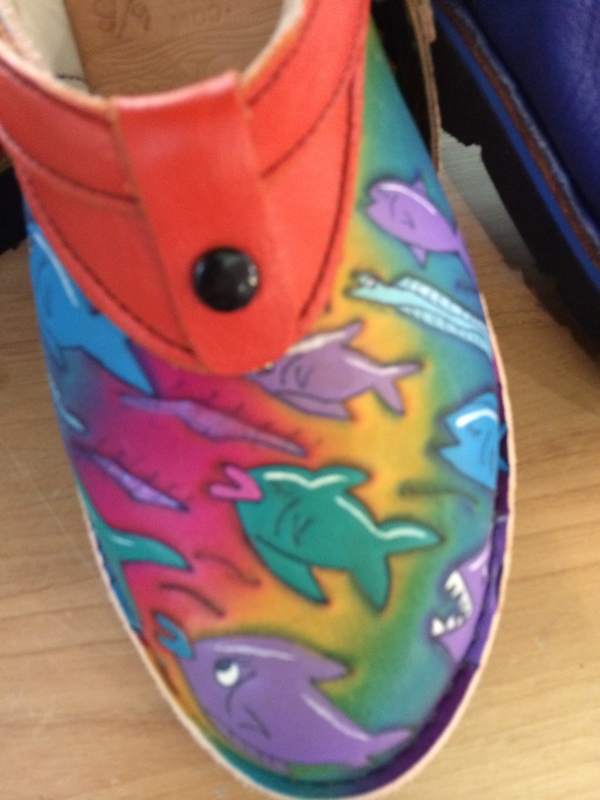 Handcrafted, hand-tooled shoes looked comfy and “cool”! The central courtyard offers seasonal decor to enjoy while dining on regional dishes selected from the food court — like Chicken Pot Pie, West Virginia Rainbow Trout, or Fried Green Tomato Sandwiches. Fall pumpkins — carved and painted — as well as what appeared to be an autumn goddess greeted us in a colorful show of the season’s best. 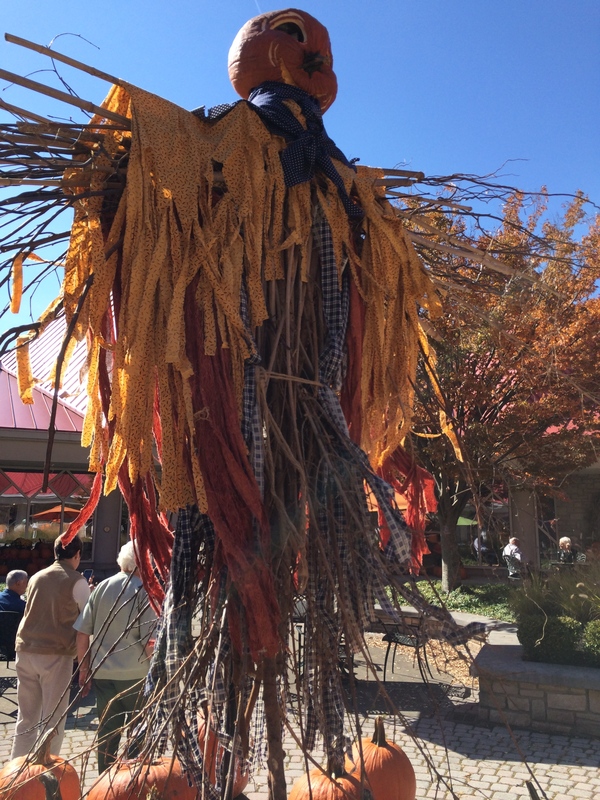 Made entirely of natural materials, this autumn goddess took center stage in Tamarack’s outdoor courtyard. If you love fine arts and crafts, join the over half a million visitors per year at Tamarack: The Best of West Virginia for sights, sounds and tasty food. It’s worth getting off the interstate to see! 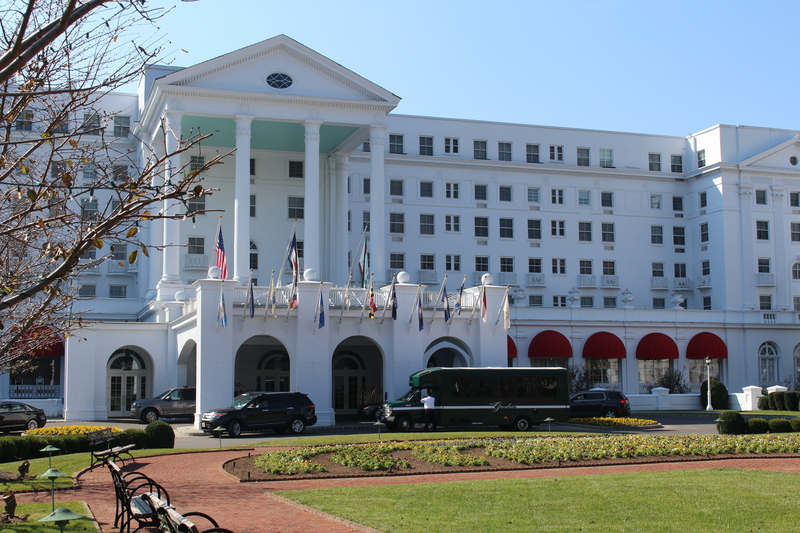 Since 1778, guests have been coming to White Sulphur Springs, West Virginia, to what is now known as The Greenbrier, America’s Resort to “take the waters” for good health. This National Historic Landmark boasts a storied history of hospitality and genteel accommodations for U. S. presidents, international royalty, and business leaders. With 710 elegant rooms, 10 lobbies, and more than 40 meeting rooms, The Greenbrier offers the finest in American accommodations on a sumptuous 10,000-acre estate nestled in the Allegheny Mountains. We, had The Greenbrier on our list of places to see in West Virginia, but specifically we came to see “The Bunker.” During the Cold War of the 1950s, the U. S. Government approached The Greenbrier, asking for assistance in constructing and housing an Emergency Relocation Center to be used by Congress in case of war. This amazing underground facility — exhibit hall, dorm rooms, and meeting spaces for both Senate and House — is now open for tours. Since photography is not allowed during the tour (be prepared to surrender your phones and cameras), we can’t show you what we saw. 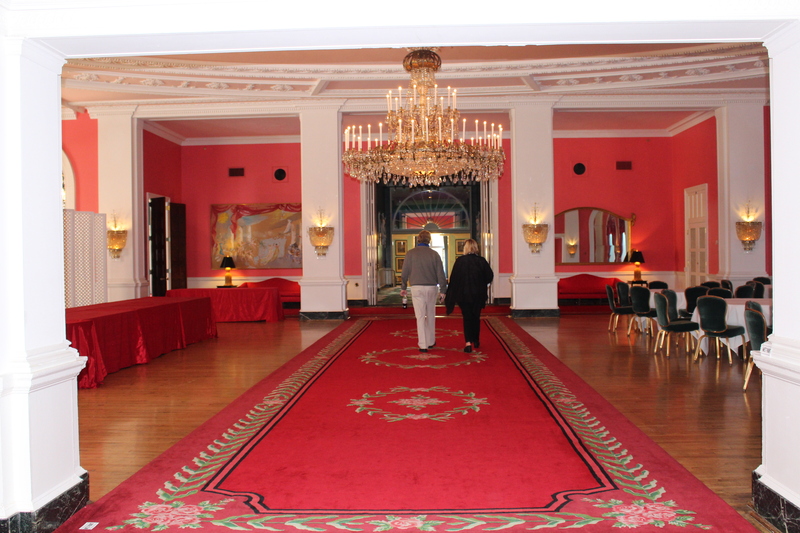 But know this: The Greenbrier’s addition is an amazing facility that was hidden in plain sight (not even the residents of White Sulphur Springs knew the purpose) but kept ready in case of a national emergency. Well worth seeing! What our random strolls through the lobbies showed us was colorful, to say the least. 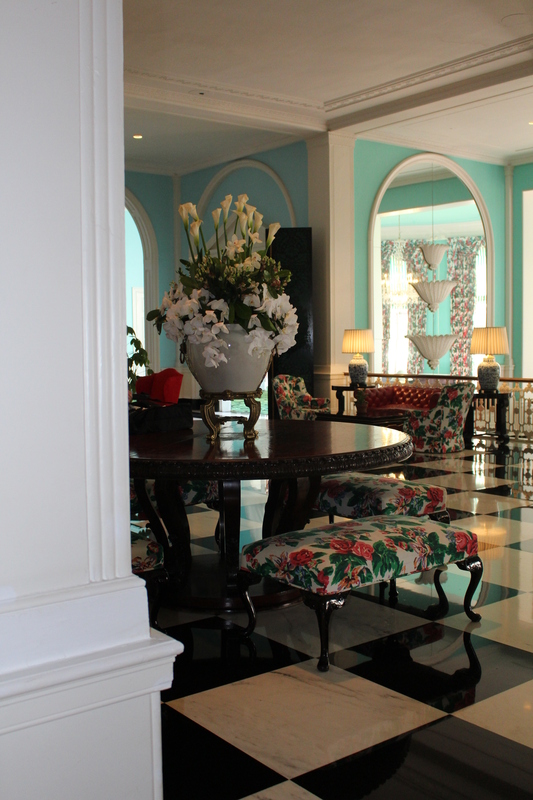 Interior spaces at The Greenbrier are clothed in colors of the Caribbean — rose, mint green, white — colors you might expect nearer the coast. And just walking through the beautifully appointed rooms makes you take note of the elegance of this luxury resort. This entry was posted in The East, Travel, West Virginia and tagged Beckley, crafts, quilt, Tamarack, The Bunker, The Greenbrier, White Sulphur Springs. Bookmark the permalink. There was a documentary on the bunker some years back, where they filmed the inside of it. I’m surprised they won’t let any photograph it now. Especially since it’s obsolete and declassified. Great post!! Thanks for the reply, Kevin. We, too, were surprised at the extent to which those in charge made sure we had nothing with which to photograph The Bunker on our person. Once we were inside, there was little the town’s residents hadn’t seen (or used) as the goal was to keep the secret by being so open! Oh, well. We complied. And we took away memories. But no pictures! You’re welcome! Thanks for sharing the experience of the visit with all of us. The Greenbrier was the model for the hotel in the Nero Wolfe novel “Too Many Cooks,” which is one of my least favorite books in that series, but it’s always grand to see photos of it, so I can better play out the action in my mind. You are teaching me something new, for sure. Thanks for the info. I don’t know if you’ve ever stayed or eaten at The Greenbrier, but if you have, I’d love to read your post. We may never get back there to spend the night even though we’d love to!! Love reading about your travels, Rusha & Bert. The Greenbrier is one of the places on my Bucket List. 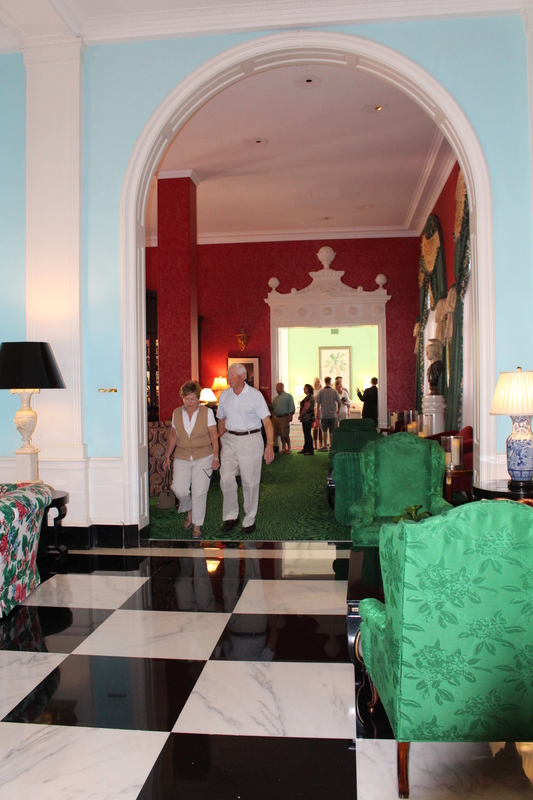 The Greenbrier is one of those magical, tucked-away places that everyone, especially in the South, should see. Thanks for taking a look!